Back Row: Liam Gaughan (immediate right with badge) next (taking the back row as 'all one') Alec McLellan, Martin? ; Mark Boardman;? ; Philip ? ; John O'Neill; Gerrard McGee; Garry ?. FRONT ROW: Lynne Christopher (immediate right eyes shut! ); Sharon? ; Samantha? ; A*** T*** ; Elixabeth ?;Donna ? ; Laura ?. Elizabeth Macbeth next to Donna ?. Back row (left to right) : Gary Macue, wee me (Gerard McGhee), John O'Neil, Ian Mackay, ? ?, Mark ?, Martin Mackay, Alex Mackay, Liam ? Think it might be Gary McHugh in back row? Is this the same Liam that I used to live right next door to in Caberfeidh Drive??! I have a picture of us dressed up to go guising at Halloween somewhere. And at a birthday party with a Doctor Who TARDIS cake. 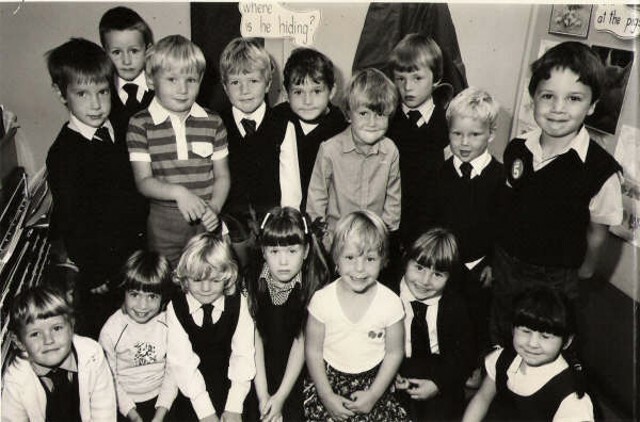 It's Philip Anderson in the middle on back row, underneath the where are you hiding sign. Yes Barry - this is Liam's Mum. Yes - it's the very same Liam! His brother, Paul was a huge Doctor Who fan hence the birthday cake. I have some good pics taken in our back garden when Paul, age 8, put on a Doctor Who play. You and your sister, Stephanie, are in these photos along with others. I will put them on the site soon.